America's Favorite Ice Bags at Wholesale Prices! All of our ice bags meet and exceed FDA and USDA requirement for food contact. Perfect for automatic and semi-automatic ice bagging machines. 8 lb, 10 lb. and 20 lb. bags are in stock and ready for immediate delivery. Our super-strong plastic ice bags are made with EVA additives to withstand rough handling and below freezing temperatures. All of our poly ice bags are made with odor-free 100% virgin LLDPE resins, which meet all FDA & USDA requirements for food contact. Choose from three different ice bag styles above in six different capacities. into one of our stock designs. What style of ice bag should I choose? Choosing the right style of Ice Bag is one of preference and packing function. Loose packed Plain Top Ice Bags, which include twist-ties for closing. Other closing options are available as an option like bag sealing tape, etc. Drawstring Ice Bags have a drawstring top for easy hassle-free closing once loaded with ice. The drawstring also allows for a convenient carrying handle for the consumer. Wicketed Ice Bags have a lip and perforation on one side of the bag, which allows for groups of 100-250 bags on a wire or plastic wicket. One side of the ice bag is either blown open by air or manually pulled out to allow for easy filling and then torn from the lip and wicket once filled. Once filled these ice bags can be sealed with twist ties, bag sealing tape, or heat-sealed. Wicket bags are used with bulk baggers and volumetric baggers. This is a partial list of machines that use wicketed ice bags: Matthiesen Automatic Wicket baggers, Matthiesen HSB 510, Matthiesen LV Series baggers, Matthiesen VLS Series Baggers, Matthiesen Model Bf-150 Bulk filler, Matthiesen Magic Finger system, JMC Automatic Bulk Ice Bagger Models BB 1600, and BB 1700. Film Roll Stock (or Form Fill and Seal Sheeting) is printed polyethylene film that is configured as a single wound or centerfold sheeting from which an automatic machine forms, fills, and seals individual ice bags. We offer competitive pricing on Ice Bag Roll Stock. Get a quote now for custom ice film! Baler Bags are larger (usually non-printed bags) on wicket for loading multiple ice bags in for easier handling and transportation. Get a quote on Baler bags. What is Metallocene and EVA, and why are they important? Metallocene is a type of LLDPE or linear low-density polyethylene resin that is used to make ice bags and film stronger than traditional LDPE – Low-Density Polyethylene. EVA is a copolymer resin additive that helps poly film perform better in cold temperatures. All polyethylene films become brittle at freezing temperatures, so EVA is added to soften the film and aid in puncture resistance, ripping and tearing. EVA is safe for food contact. What size bag do I need? 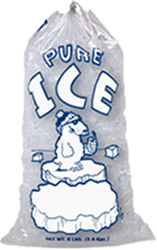 Packaged Ice is sold in various capacities and the bag sizes often vary based on the style and size of the ice cubes being packaged. 5 lb. Ice Bags: 5 pound Ice Bag cools approximately 18 cans – 5# ice bags are commonly found at convenience stores, liquor stores, beach shops, etc. 8 lb. Ice Bags: 8 lb. Ice Bag cools approximately 22 cans – 8# ice bags are the most common size at convenience stores, liquor stores, bait shops, etc. 10 lb. Ice Bags: 10 lb. Ice Bag cools approximately 27 cans – 10# ice bags are the also common at grocery stores, warehouse clubs, convenience stores, liquor stores, ice house vending machines, etc. 20 lb. Ice Bags: 20 lb. Ice Bag cools approximately 55 cans – 20# ice bags are commonly used for commercial applications, caterers, fishing charters, warehouse clubs, ice house vending machines, etc. 50 lb. Ice Bags: 50 lb. Ice Bag cools approximately 138 cans – 50# ice bags are commonly used for industrial and commercial applications, bulk ice sales for stadiums, sports arena, bars or anywhere large quantities of ice are needed. Are Ice Bags FDA/USDA approved? Actually, the FDA doesn’t approve anything they just issue requirements. All of our ice bags and film meet the FDA and USDA requirements and are made of 100% virgin resins. A certificate of compliance is available at your request.